And the dead were the dead; this wa no tome to be pitying them or asking silly questions about their outraged lives. Such sights must be taken for granted, I thought, as I gasped and slithered and str5umbled with my disconsolate crew. Floating on the swurface of the flooded trench was the mask of a human face which had detached itself fromt he skull. 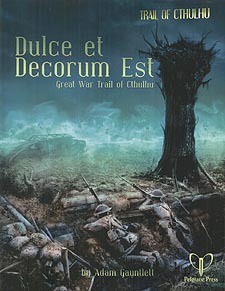 This collection of adventures considers the Great War (1914-18) from the perspective of Trail of Cthulhu. From the conflict in the air, to the depths of the sea, the home front and the different battle fronts the Great War affects the lives of countless millions of people. It also brings humanity into conflict with elements of the Mythos, and in particular the Charnel God Mordeiggian who, for the first time in centuries, may actually have more to devour than it can stomach. The forces of the gods do not take kingly to being disturbed, nor do they usually play favourites; unless your players are careful, they may find themselves attacked and wiped out in an instant, caught in an otherworldly crossfire thy can only hope to survive, not understand. The once-mighty Vaterland is a prisoner of politics. She is trapped in New York Harbour, as war rages in Europe. Her crew and Commodore are just as much prisoners as the ship herself, though they are making the best of their captivity by hosting concerts in support of the German relief effort. You've come aboard at the behest of John Rathom, editor of the Providence Journal, in hopes of uncovering a German plot. The crew of German U-boat UC-12 is sent on a standard mission; penetrate the North Sea defensive zone, make their way to Tyneside, lay their mines and return. But nothing in the Great War is that simple. While underwater the crew start to hear a strange, muffled booming noise, ringing like a sequence of church bells. It's not whales. It's not enemy forces. Something else is down here. While settled on the sea floor to get some much-needed rest, the crew starts to act suspiciously. Someone is up to no good. The ship's cat disappears and a strange weed is found grown on board.